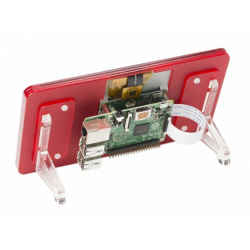 Protect your new 7" Raspberry Pi Touchscreen with this lovely little display frame from Pimoroni! Designed with a slimline profile, it's perfect for keeping your Raspberry Pi screen upright, and at an ideal viewing angle! Got one of those shiny new Raspberry Pi 7" Touchscreen Displays, and need some way to mount it?! Well, we're proud to introduce ModMyPi's 7" Touchscreen Case and Stand! Made with our trademark stealth-matte black acrylic, and accented with clear (to leave the good bits visible), the case itself is constructed of 7 layers. The rear is protected with a plate of acrylic, so you can leave it flat, or mount it as you wish! Alternatively, we've included a nifty skeleton stand which the case slots into, and the whole unit comes complete with non-slip rubber feet - it is a touchscreen after all, so you don't want it walking across your desk when everyone's poking it! -Supports any revision of Raspberry Pi (directly-pluggable). -The protective case consists of six-piece PMMA enclosure that snaps together around Raspberry Pi 3 Model B. -Provides the best available protection/accessibility for Model B, Protect and secure your Raspberry Pi from shocks, scratches and dust. -Replace the case top with the display. This is the newest raspberry pi 3 model B+ 3.5 inch touchscreen and case. 1. 9-layer Acrylic Case , well protective , needn't use the screw hole on raspberry pi. 3. Please remove the protective film sticker on the surface of the acrylic layers. 6. To use this touchsreen , you need to configure the raspberry pi system first. The touch screen connect to Raspberry Pi by GPIO pins only , please don't use the HDMI interface when you use the touch screen. We make 2 holes on the bottom so that you can mount the case on the wall or something or somewhere else . This design is very convenient when using the 3.5 inch touchscreen. 5. There are Black / Gray / White / Transaperent color to chose for the case. This model is the black case. 2). 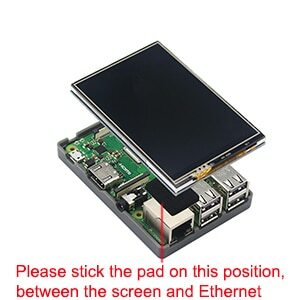 Please stick the pad on the back of the 3.5 inch touchscreen ( as the picture shows ) , then insert the 3.5 inch touchscreen on Raspberry Pi by GPIO pin correctly. This LCD Module need install driver first. Wait a few minutes for the system to reboot.